Throw this bag over your shoulder and it WILL get noticed! We call it the Tipi Bag because it reminds us of a tipi with the smoke flap folded over. 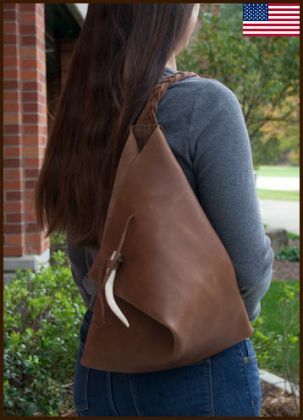 This natural, rustic design features a unique antler closure and a braided strap which clings securely to your shoulder. It is designed for either the right or left shoulder and measures 12 in. wide and 16 in. tall. Keep in mind that the carrying capacity of the bag is smaller because of the way the top folds over. The strap is about 21 in. long and it hugs your shoulder close so the bag itself hangs on your back.